Live Auction, Raffles, Silent Auction, and Games!!! Last year’s event sold out, get your tickets now and don’t miss out on an action-packed evening with friends! With a special intimate acoustic performance by local rising star Colt Buckelew & The Crossroads, and Tiffany Valentine. 10th Annual Ducks Unlimited Hays County Kyle, Texas Chapter Banquet & Drawing Thursday June 4, 2015 this time at a new venue, the Texas Old Town in Kyle. Ducks Unlimited is a non-profit organization dedicated to waterfowl and wetlands conservation. Funds generated in the United States through voluntary, tax-deductible contributions are used to enhance, acquire and restore habitat in Canada, the United States and Mexico. Items will be drawn in order listed. Need not be present to win!!! Sponsorships and Donated Items May Be Tax Deductible. Please consult with your accountant/tax preparer to determine eligibility of tax deductions. Hays County’s Ducks Unlimited Federal ID Number is 20-4514414.
if you are unable to attend. The Amigos del Diablo website was designed, developed, and launched. If you would like a site like this set up for you, please Contact us. The Wagon Road West Distillery website was designed, developed, and launched. 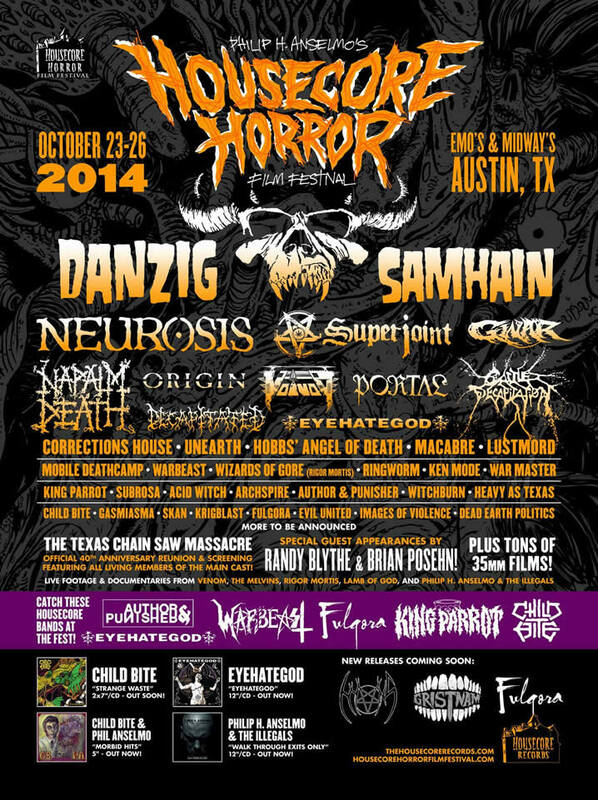 A friend and I volunteered again this year to and helped out with Philip H. Anselmo’s and Corey Mitchell’s Housecore Horror Film Festival (HHFF) Part II held in Austin again this year. It was another great experience as I was in the Lead position in charge of other volunteers. Working as Head of Security for the outdoor Midway Stage at Midway Field House – Sports Bar & Arcade. We were all dedicated to make this an even bigger success than last year, so that we can continue to keep this event in Austin. Phil reassured us that the event will go on again, as well as in Austin. This year celebrated the 40th Anniversary of the Texas Chainsaw Massacre, locally made cult film. Taking place on the weekend before Halloween, people came out from all over the world to attend the event, melding music and film together perfectly. Sadly, Corey Mitchell, the Co-Founder of the Festival passed away of a heart attack during load out at Emo’s, only hours following the conclusion of the festival. Our hearts and prayers go out to Corey and his family. Read more. The Austin Skin Studio website was designed, developed, and launched. A couple weeks ago, I WON Nashville Outlaws – A Tribute To Mötley Crüe [Digital Download] and The Dirt: Confessions of the World’s Most Notorious Rock Band [Digital Download] and I have been entered in to a chance to win the grand prize an Autographed Copy of the Dirt from all members of the band!! All from KLBJ FM, Austin’s Rock! Today, B-Doe who works the 10:00 AM – 3:00 PM Weekdays DJ shift called me. He said that he has been calling several times over the past few days, but we had been on a long family vacation in Rockport. He never left a message because he wanted to surprise me. I WON an Autographed Softcover of The Dirt: Confessions of the World’s Most Notorious Rock Band, by all of the members of Mötley Crüe! An edited version of our conversation was aired on KLBJ FM. Listen to the teaser and the broadcast. I just WON Nashville Outlaws – A Tribute To Mötley Crüe [Digital Download] and The Dirt: Confessions of the World’s Most Notorious Rock Band [Digital Download] and I have been entered in to a chance to win the grand prize an Autographed Copy of the Dirt from all members of the band!! All from KLBJ FM, Austin’s Rock! The Texas Butcher Paper website was designed, developed, and launched. Similar to that as recommended by Aaron Franklin, owner of Franklin Barbecue in Austin, TX. Butcher paper is most often used in the Bar-B-Que scene as a basket/tray liner as well as carry-out wrap. Pink Butcher may also be used as a sandwich wrap and adds a mark of distinction to the wrapped item so it stands out from other wraps. Beyond wrapping sandwiches and dressing up meat and fish, see the advantages of cooking with pink butcher paper. Pink Butcher paper enhances the appearance of meat and improves food safety and handling for those in the food service industry including butchers and deli and grocery store owners. The pink color dresses up the look of sandwiches, barbeque, fresh meats, poultry and fish. All of our pink butcher paper is 100% FDA Approved. The Hye Texas Wine Tours website was designed, developed, and launched.